A conversation from earlier today highlighted the difference between my semi-paranoid approach to parenting and Steph’s more relaxed, “wing it” method. For the record, I like Steph’s method better. 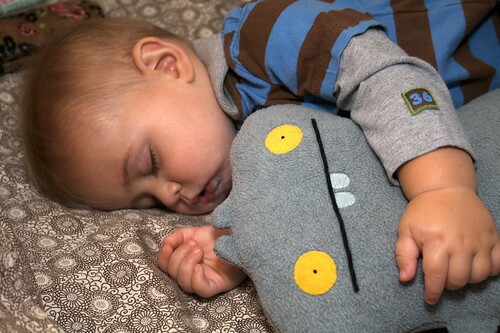 Caleb Sleeps with Babo, originally uploaded by StephLewis. There’s just something about seeing that little boy clutching a monster in his sleep that is inescapably cute. Last Friday Caleb turned one year old. I am so proud of my boy. I love watching him grow, I love getting to know him, I love seeing his personality develop and start to show, and I even love all the difficult lessons fatherhood is teaching me right now. Well, I usually love those. Especially when I finally get the lesson through my thick skull. One of the pastors at our church, Pastor David Michael, adapted a collection of bible passages into blessings that he would recite to his children before they went to sleep. When he showed these blessings to other parents, they loved them, so he published a few dozen of them in a little booklet. I chose the blessing based on Psalm 112 to give to Caleb, and although I can’t quite get through the whole thing reading it out loud, I wanted to share it here with all of you because it means a lot to me. This is what I want for Caleb. I want this for him more than I want anything else in life for myself. May you find great delight in the Lord’s commands. May your children be mighty in the land. Even to the next generation, may you and your children be blessed. May you find your wealth and your riches in God. May you endure in righteousness forever. Even in the darkness may the light dawn for you. May you be a gracious, compassionate and righteous man. May you never be shaken. And may your name be remembered by the Lord forevermore. I know for certain because of the DNA I’ve given him and the world he lives in that Caleb will find himself in deep darkness at some point his life, either caused by himself, or by circumstances beyond his control. Knowing that God’s light would dawn in the midst of that is the greatest thing I could ever ask for him. Pain is guaranteed, but rescue isn’t. Caleb, if you fear the Lord, you don’t need to fear that darkness; the light will dawn for you. Friday or yesterday (I can’t recall which), he said his second word. It was “Lella-ella-ella-ella-ella”, which is what he calls Ella. He doesn’t use the word when she’s not around. He doesn’t babble it. But he says it when she first enters a room or comes running up to where he is. We’re pretty sure it’s purposeful. This afternoon, while at Dairy Queen, he said his third word. And I’m proud to say it was “Dada.” He looked up at me from across the table and just said it. Steph and I paused for a second, like, “Did he just say that?” Then he said it again. We encouraged him about it. Then Steph took him away for a minute and brought him back, and when he returned to the table and saw me again, he said it again. It was really exhilarating for me! I know I came in 3rd place to Mama and the dog, but I’m OK with that. The thing that I’m pretty amazed about is that only yesterday he turned seven months old. I don’t know anything textbookish about child development at all, but people who do know tell me that’s pretty early for him to be picking this stuff up. So I’m excited about that too. We’ve got a real talker on our hands!